HB Furniture supply the finest British furniture using a close network of talented people, their products are manufactured in the UK using a combination of traditional skills, new technology and the finest materials. 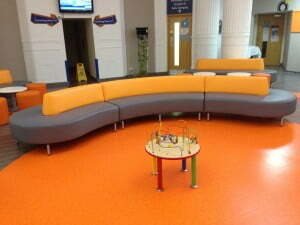 The Curve Collection was developed in conjunction with an interior designer for Birmingham Children’s Hospital specifically for the main reception in the children’s ward. 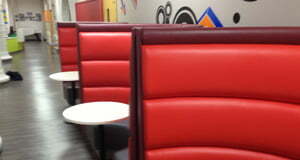 HB Furniture also introduced the curve booth which allows patients and nurses to have private areas for consultation. 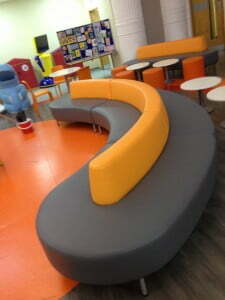 In contrast, the large back to back curve seating areas allowed the children to have free reign. All furniture produced was made to the highest standard in terms of frame and foam construction to guarantee a robust and comfortable product. In terms of finish and fabric selection, HB Furniture chose the Chieftain Fabrics Just Colour range principally for the colours and technical specification that it offered within a hospital environment. Chieftain Fabrics have over 60 years experience in the design and production of high-quality performance fabric and contract upholstery and with their unique mix of specialist expertise, innovative R&D and advanced materials, Chieftain Fabrics produce an inherently better fabric which was an ideal fit for HB Furniture. With regards to the general construction of these products, all sewing and stitch lines were reinforced to add to the longevity of the seating.